» Cyclists at the ‘gore:’ What to do now? Here, at Pacific and the I-5 off-ramp, motor traffic from the rear catches cyclists in a pincer movement from left and right. When the bike/ped commission met in September, according to the minutes, Stephanie Nappa introduced herself as someone who had recently moved to a part of Albany east of I-5 and had problems finding a good cycling route toward downtown. “The most difficult spot is on Pacific … at the southbound off-ramp,” the minutes say. Ron Irish, the city’s transportation systems analyst who serves as the commission’s staff, told me the board discussed the issue. A long-term fix will have to await reconstruction of the interchange, something that ODOT is working on in the design stage. This would include reconfiguring the interchange by, among other things, adding a southbound on-ramp to I-5 and installing a signal at the off-ramp. But construction is years away. But getting this done, he adds, is complicated because the roads are controlled by ODOT and the site — the “gore”– is outside of both the city limit and, amazingly, the Albany urban growth boundary. In reality and practice, though, the solution is not all that involved. When I reach that point on a ride, I stop so I can get a good long look up the off-ramp. When it’s clear, I hustle across to the other side and go on my way. Then I get off Pacific the first chance I get by making a right on Albany Avenue and following Salem Road into town. The view upstream from the end of the “gore” curbing. I’ve had this same problem numerous times on my bike. And have also dealt with it as Hasso suggested, i.e. stop the bike at the gore, twist around and look up the off-ramp and hope there is a large enough gap to pedal across ramp safely. A short prayer helps also. A lot of folks also inappropriately ride the sidewalk on the south side of Pacific Blvd where it turns into Knox Butte to avoid this vexing problem. 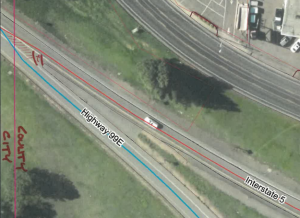 The issue is exacerbated for bicyclists and motorists alike by the tendency of vehicles coming off I-5 to maintain their speed going onto Pacific. It is a long, gentle off ramp, and the vehicle has their own lane going onto SE Pacific Blvd, so few vehicles slow much at all. A great place for speed bumps (ha, ha) but fat chance of anything happening. Gosh–what a burden—people still have to figure something out by themselves. Do we really expect gov’t to make a recipe for everything?? The point is that if there were markings, motorists would know to look out for bicyclists. Sarcasm not needed. “People” might reasonably expect that at the very least “government” might not set them up for a nearly impossible situation, simply because they are not the favored class. I refer, of course, to being bicyclists rather than motorists. Read it again… This is not about cyclists on I-5 (which aside from the foolishness of riding on I-5 would actually be easier from a merging standpoint), it is about coming into town from Knox Butte, riding on the right hand shoulder/bike lane and then having it just stop after passing under the freeway because the off-ramp which cars are using to leave the freeway/enter Albany is now also on your right, leaving a cyclist stranded between two lanes of moving traffic. You have a similar problem heading North on Main into the roundabout. The bike lane just disappears at the same spot traffic is merging. The question is begged. Why is it that America’s public roads, which were designed to cope with motorized vehicular traffic, must bend over backwards to accommodate non-motorized vehicles? 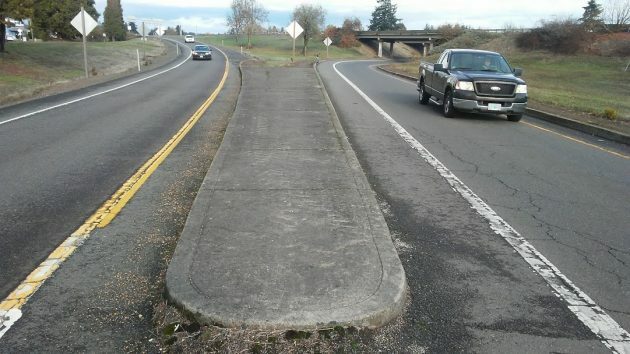 The system, as designed, was never intended to make roadway for bicycles. The entire system was/is made for cars, trucks and buses. While it seems somewhat clear why a bicyclist might not wish to be mowed down, it seems perfectly and abundantly clear that America’s system of highways and byways were constructed for the benefit of cars, etc. It seems Albany might require a separate system of “bicycle roadways” so as to satisfy the pedaling lust. Otherwise, we will be continuously subjected to the incessant carping of petulant peddlers. Lets rebuild the entire area for the 3 people a day ride their bikes here. Bikes don’t belong on most roadways!